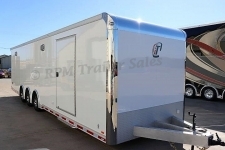 RPM Trailer Sales is home of the highest quality Race Trailers and Custom Aluminum Race Trailers in today's market. If you are interested in a premium quality product, then you are in the right place. We don't just stock the best priced race trailers, but we can custom build any race trailer to fit any racers needs. The sky's the limit when you order a Race Trailer from RPM Trailer Sales. RPM is proud to design and build any trailer to fit the needs and budget of any racer, small or large. RPM Trailer Sales has a continuous stock of 24’ race car trailers to your loaded custom 48’ gooseneck race car trailer. We also build custom race car stackers trailers. Anyone looking to build a 3 car race trailer or more then RPM Trailer Sales is your #1 choice for those racers looking for top of the line great quality trailers. Take a look at our race trailers and if you don’t see exactly what you are looking for just give us a call at 706-654-2882 and we will be happy to sit down with you and design your perfect trailer.